Thanks to the fine folks over at Brickset, we now know what the two remaining BrickHeadz sets are! 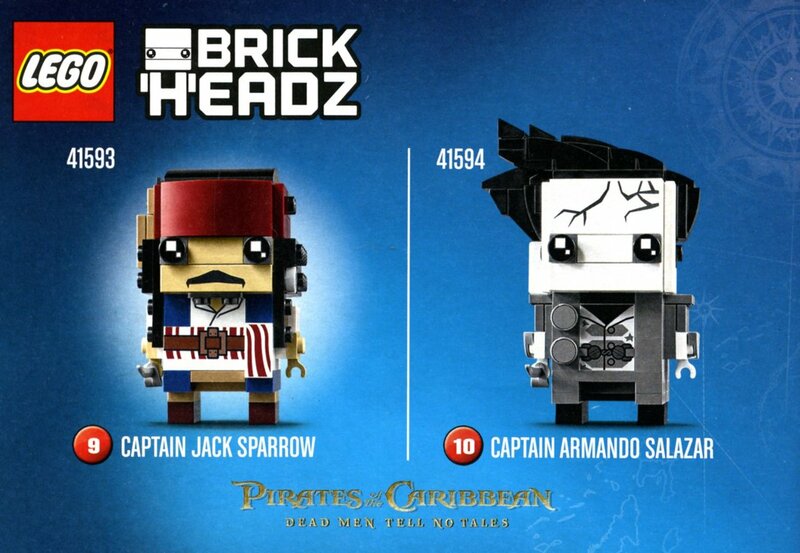 They are 41593: Captain Jack Sparrow, and 41594: Captain Armando Salazar from the Pirates of the Caribbean: Dead Men Tell No Tales film. If you have no idea who Salazar is, well, I was in the same boat (geddit). He’s essentially a really bad guy, and is portrayed by Javier Bardem in the movie that’s coming to cinemas May 26. I’m a massive POTC fan, so seeing these made my day! They’re not available in the LEGO Shop Online yet, but they’re on the back of some of the boxes, which are freely available, so the news is out there now. What do you think? Do you have a new favourite? Hi Ashleigh, unfortunately we don’t know. I know that distribution will increase in July, but at the moment it’s limited to the Certified Store at Dreamworld, the LDC in Chadstone, and LEGO Shop at Home online. They may come to stores, but I can only guess they’d come to Myer. I’ll post more details in July when I know something. Until then, unless you’re within easy reach of the two physical stores, online is your best bet. Hi Ashleigh, I’ve just heard that David Jones is now stocking the Brickheadz in store and online. No word from Myer yet, but try DJs. Let me know how you go! John, Thank you for the reply! I just checked online & found him! 🙂 Will definitely go out and get him, thanks again, happy building!